Border of Sedum 'Herbstfreude', Echinacea purpurea 'White Swan' (Eastern purple coneflower), Agapanthus, Kniphofia 'Tawny King', Helenium 'Waltraut', Salvia × sylvestris 'Mainacht' (wood sage) and Eupatorium maculatum 'Purple Bush' beside The Clover Hill Gazebo at RHS Garden Hyde Hall overlooking the Hyde Hall estate. The Shrub Rose Garden in summer at RHS Garden Rosemoor. 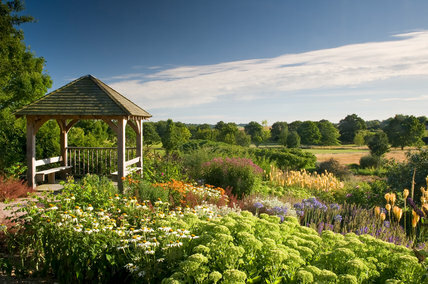 The Potager in summer at RHS Garden Rosemoor. View of the Lab and Canal in summer at RHS Garden Wisley.